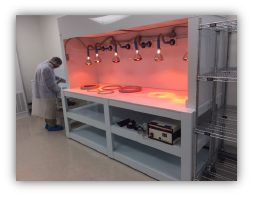 Parts are N2 dried after rinsing, then moved under the clean room heat lamps for final drying. The final bagging area also has HEPA filters and blowers to maintain a class 100 environment during packaging. Ar or N2 is used to purge the bag prior to vacuum sealing to remove any residual moisture which could oxidize the part surface while sealed. 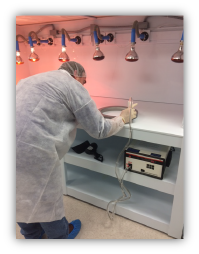 Surface particles are measured in the clean room using a Dryden Qiii surface particle monitor. A vacuum wand is moved across the part and any loose particles are collected and read by a laser particle counter in the unit. 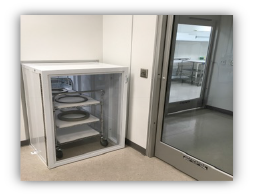 Particles are measured down to 0.3um particle size and up to 10um size. 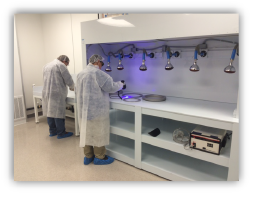 Surface contaminants are also monitored using a blue light (near the UV spectrum). Organic and other contaminants light up (fluoress) when subjected to the blue light wavelength. 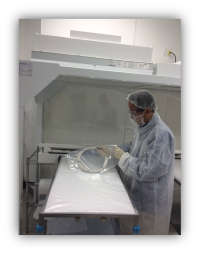 Parts are transferred from the pre-clean room to the cleanroom via a pass-through area.